I currently use an augmented version of our school's assessment system. All of our teachers are using standards/skill based grading allowing for re-assessment, but because of the technology I have available in my classroom (ie. class set of laptops), I can do some things that my colleagues can't. The system all starts with the skills list. This isn't news to you because if you're reading this blog, you're most likely reading dy/dan as well. Our district made the move towards standards based instruction a few years ago with some of our campuses throwing out the textbook pacing and teaching a standard at a time. We have decided to go one further and break up the thicker standards into smaller more manageable skills. Each student gets a skill list where they keep track of their progress. They also have a "playlist" where they set goals for the week. I spent the better part of the last two years populating our school website with examples. They have been organized by text section, state standard and soon, I will have them done by skill. Many of these were recorded during class and are the result of student generated questions. I hope to upgrade these examples so they are a little cleaner. The study guides are simply .html exports of the ExamView tests I have created. In hindsight, I think I'll go back and make all the study guides short answer as opposed to multiple choice. I have found that too many student won't show work otherwise. Ideally, I would like the skills to be just that, skills. I want my students to access these study guides and examples on their time which would free up class time for projects and problem solving. Based on conversations I've had with my 7th graders, they are realizing the power of being able to access these resources at their convenience which gives me confidence that a classroom inversion is more likely next year. It's tough to have them unlearn certain behaviors, but because my classes are really a two year program, I see much growth the second year. Call it what you want, it's basically the first test I give my students which sets the bar for them in the grade book. This semester, these tests have been administered solely through the ExamView Test Manager. Students access the tests through the EV Player and go to work. Once a student finishes the test, they get immediate feedback on each question. They know what they answered correctly and what they missed before they leave class. Skill lists are updated on the spot. Students have been taking screenshots of their feedback sheets and save them to their folder on the server. 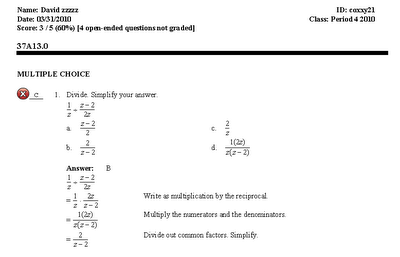 These screenshots double as proof of their completion of the assessment as well as a set of practice problems they can do as they prepare for re-assessment. I set up all of the tests so that students can access them only once. This prevents them from simply memorizing the answers from a test and then doing it again. That's why dynamic questions are a must. I have a set of post tests ready to go--it takes just a click of the button to calculate new values for the test. On most tests, I will make some of the questions short answer so students have to do some explaining. 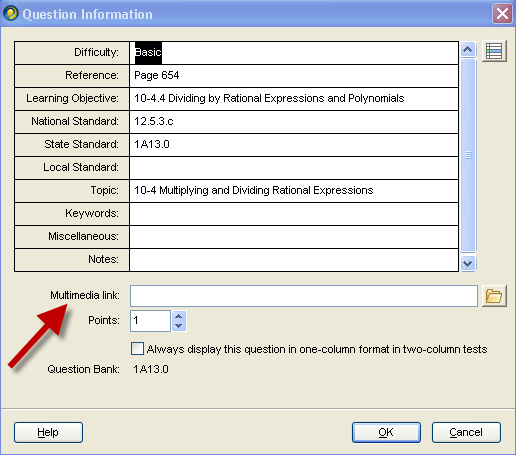 There is not an equation editor available for students while they take the test so I have to be careful which question types I use for free response. 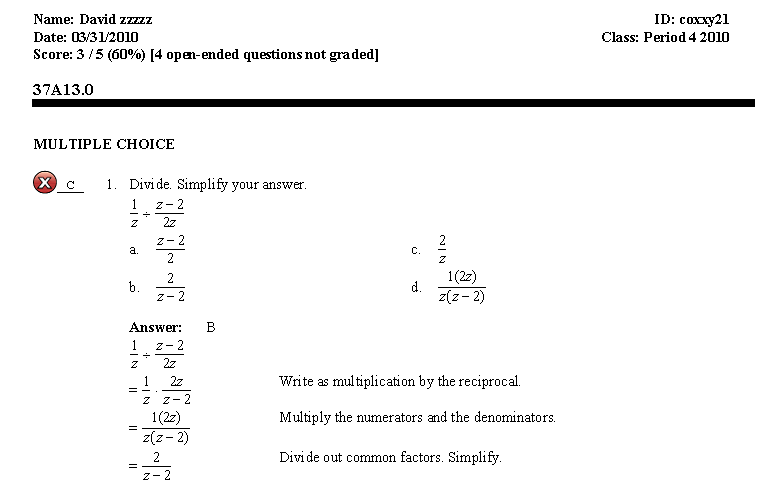 In order for a student to take a re-assessment they have to do a couple of things. Demonstrate they recognize the mistakes they've made and show me they know how to fix them. I've tried to make all of my expectations as transparent as possible. There really are no surprises when it comes to test time. Here's the floor of what I expect you to know, now show me. It's been interesting talking to parents about this because they like the system but can't believe it's this simple. I just learned that I can also attach a link to a video or audio file in the test player. This will allow me to use these media as prompts for future test questions. I'm not exactly sure how I'll use it but I can see myself doing a screencast of myself doing a problem incorrectly and having students pick out the mistake. I can also see showing a clip of a projectile and asking students to find it's highest point. My plan for next year is to develop a set of projects for students to do that incorporate a group of skills. Students will only be able to work on the project once they have demonstrated proficiency in that given skill set. My farming project may act as a true semester project this way. But instead of waiting until the end of the semester to give it, I will give it to them at the beginning of the year and say they have until the end of the semester to finish it. Anyone up for developing some projects? How'd you get a set of laptops for your room? I love the idea of SBG. I really want to get there and I think I might be ready for next year's classes. I forget which one of you said it, but I'm totally feeling the "I didn't know I was such a bad teacher until I met you guys" thing going on here. I have Exam View but I don't really know how to use it. Advice? I don't have laptops but I'm assuming it's the same concept if I print the tests our on paper? I just wanted to thank you for all of the work yoou do and the fact that you are willing to share it. I am in the process of implementing my own version of SBG in my Algebra 2 classes and have found myself visiting several blogs, including yours, to get some ideas. I like the idea of projects that incorporate numerous skills. We are on a trimester system (12 weeks each) and will be going to a 4 DAY SCHOOL WEEK next year (North Branch, MN). So now that I kind of have things figured out I will have to retool everything to work with the 4 day week. Class set of laptops is courtesy of GATE funding. SBG has really changed the way I do things. Don't beat yourself up. You're not bad, you just have chosen to surround yourself with a bunch of self-reflecting educators. What would you like to do with ExamView? What test question banks do you have. I'm not sure what advice to offer other than decide what you'd like to do and I'll help any way I can. Thanks for stopping by. I have to admit that most of what I share have been inspired by all the other awesome math bloggers out there. Four day week, huh? Is this a budget thing? Will you make up the days be extending the number of weeks? The 4 day week is a budget thing...we have had to cut over $10 Million from our budget over the last 6 or 7 years and they prject a savings of over $150,000. It will keep teachers in the classroom. Our day will be extended about an hour or so and we will be in session for 149 days rather than the 173 we now have. Thanks for laying it all out in one post, David. The more I use ExamView, the more I like it. You've inspired me! David, this is what I am wanting to work towards as well. The whole process has really forced me to look at what and how I am assessing. It certainly has been an eye-opener. I am scribbling notes about projects I want to incorporate next year. Matt, I an having the same issues as you. I started SBG this trimester and I am trying to keep up with the re-assessment side of it. At the moment, I feel like I am drowning in paper and I haven't seen my desk in weeks. I am looking ahead to next year, thinking that maybe I will have a good portion of the legwork in place. It is extremely easy to allow students to reassess when the exams can be delivered online. I truly believe that in order allow for re-assessments in class, we have to use some sort of technology. Most of the teachers that implement SBG have students come in on their own time which creates two problems: 1)Some kids simply can't come in after school and 2)Teacher has to give up more time. I think that next year I will create a form for students to do an exemplar type problem for the given skill to show me before they re-assess. Sometimes I'll change up the passwords so they'll have to ask for it. I don't mind the "blind" re-takes as much this way, because it's really not much more work for me to have a different form of the test ready to go. I want them to be responsible, but if push comes to shove, it really only takes about 45 seconds between a student asking to take a test on skill #30 and me sending a copy to the folder for them. I'm definitely open to suggestions on for projects. If you have any ideas, I'd love to hear them.